Rock guys had better dust off their bludgeons, because a mere nine months later, Barry’s back, as beloved by the masses as ever. If the Fifties album imagined an Eisenhower era devoid of revolutionary hip swivels and redneck piano players who married their cousins, Manilow’s follow-up, The Greatest Songs of the Sixties, covers the Decade of Love with a fig leaf, eliminating war protests, mud baths, and brown acid from the picture. These were the sixties that besotted adults and sheltered children knew: a swaggering, bemused era of Rat Pack swingers, Bacharach candlelight, and “Blue Velvet” before David Lynch got his twisted mitts on it. 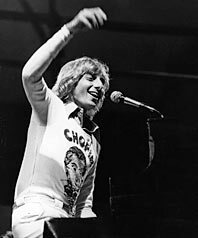 Released on October 31, Songs of the Sixties logged the biggest one-week sales total of Manilow’s career, with 202,000 units sold—the week before the Democrats retook Congress. I’m sorry, but somewhere out there these voting blocs overlap. In fact, I’m willing to gamble that Manilow fans are a much more liberal bunch than critics give them credit for. Think about it: They have a weakness for men in princess sleeves and spangles, they’re giving an indirect thumbs-up to Bette Midler (Barry was her pianist and arranger in the early seventies), and they’re willing to risk shame and derision for a cause they believe in. Try as I might, I just can’t see the guy as a threat to rock and roll’s integrity. Frank Sinatra and Dean Martin got revived by youthful hipsters in the nineties, and loud guitars survived. It’s those late-sixties purists tending the fragile flame of rock’s rebelliousness who are starting to look archaic. Why do rock and pop have to be opposing forces? Little Richard didn’t kill Patti Page—hell, she’s still singing!—any more than the Grateful Dead obliterated Tom Jones or Led Zep permanently deleted James Taylor. There’s room for all. It’s okay to love Joey Ramone and Barry Manilow without being a traitor to either side. I do. I even see telling similarities between the two. A homely Jewish kid from Queens who stuck to his guns no matter which way the trends blew; a homely Jewish kid from Brooklyn who stuck to his guns no matter which way the trends blew. I think Barry deserves his comeback. He’s been preparing himself for decades. Trained at Julliard, schooled with Mama Bette, he spent the years between megahits devoting himself to the pop canon with the fervor of a monk, recording albums of big-band standards, Broadway baubles, Sinatra favorites, and small-band jazz—Sarah Vaughan and Gerry Mulligan appeared with him on the lovely 2:00 a.m. Paradise Café in 1984. He’s the first singer, ever, to synthesize the pop traditions that pre- and post-dated rock and roll, tracing an unbroken lineage from Les Brown to Tony Bennett to Frankie Avalon to Paul McCartney. The common thread, of course, isn’t lust—it’s romance. Barry understands the difference between the two, and consciously chooses the latter. When I see Barry and his minions locked in a pas de milles of mutual adoration, I get the itch to join in. Barry’s my escape into the ordinary. He’s irrational, like crying at a Kodak commercial. He’s an indulgence, a pedicure, a three-minute vacation. Joey Ramone’s always waiting for me when I return.